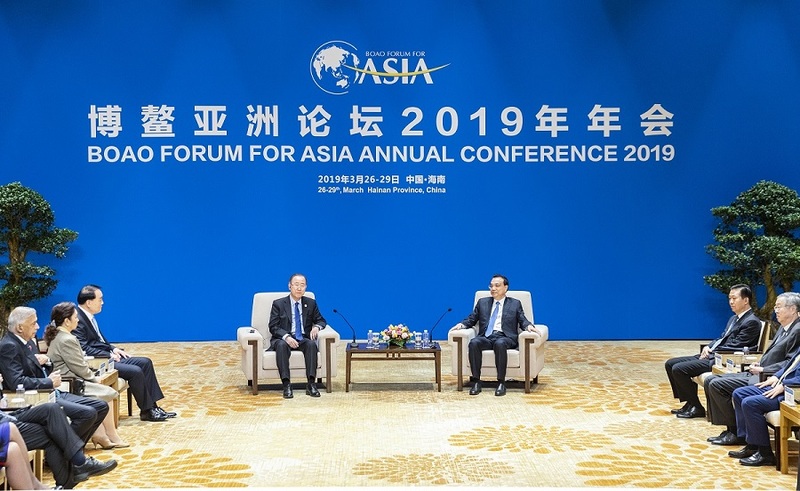 Chinese Premier Li Keqiang meets with Ban Ki-moon, chairman of the Boao Forum for Asia (BFA), as well as some members of the BFA board of directors in Boao Town, southern China's Hainan Province, March 27, 2019. Chinese Premier Li Keqiang met Wednesday with Ban Ki-moon, chairman of the Boao Forum for Asia (BFA), as well as some members of the BFA board of directors in Boao, Hainan Province. Since the founding of the People's Republic of China in 1949, particularly after the beginning of the reform and opening-up in 1978, China has made huge economic and social development achievements, said Li, adding that China remains the world's largest developing country and it still has a long way to go to comprehensively modernize. "China advocates maintaining multilateralism, respecting diversity of civilizations and allowing countries to explore their own development path according to their national conditions," Li said. The premier said China will continue to push reform and opening up, which will not only help China achieve its goal of modernization, but also contribute to global development and prosperity. Ban Ki-moon, former Russian prime minister Viktor Zubkov, and Gloria Macapagal Arroyo, speaker of the House of Representatives of the Philippines and former Philippine president, congratulated China on the 70th anniversary of the founding of the People's Republic of China and said China's development achievements are unparalleled in human history. They said unilateralism and protectionism are challenging multilateralism and globalization, and amid world uncertainties, China has responded by advancing structural reform and expanding opening up, setting an example for other countries. 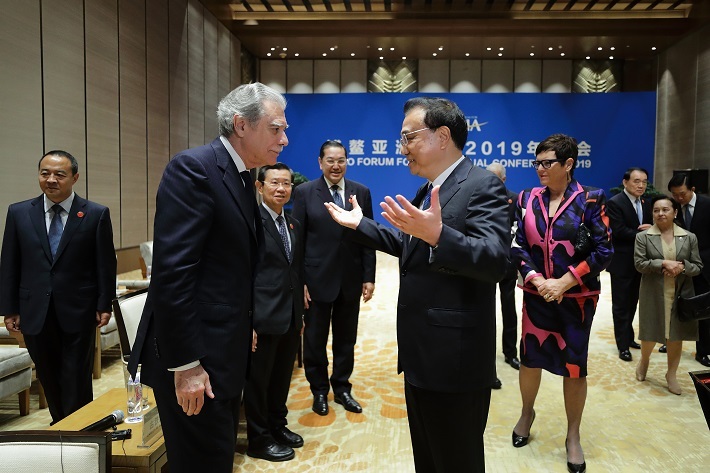 The future of China, Asia, and the world is closely connected and the forum stands ready to work with all parties to promote Asian economic integration, and contribute its wisdom and strength to an inclusive development among all countries, they said.